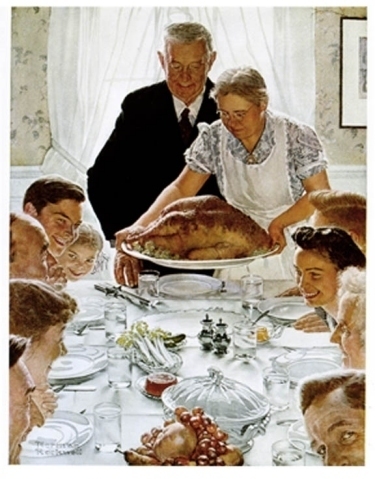 In “Freedom from Want,” artist Norman Rockwell presents an idyllic image of an American family. And while your bird may not look quite so perfect, you know that you’ll enjoy a feast on Thanksgiving Day, hopefully surrounded with the ones you love. But in reality, one in 8 Americans struggles with hunger. In Chicago, I see hungry people every day. And I want to help. So I bought $50 worth of Chicago Shares to give. Chicago Shares is a voucher program designed to help feed people in need. 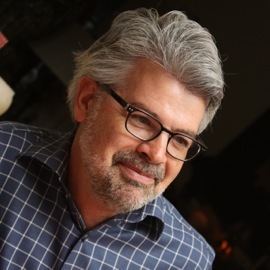 You purchase the shares, which are like coupons, in $1 increments. 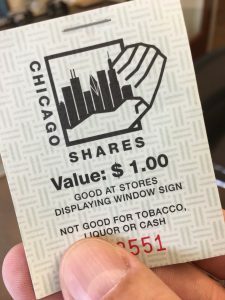 When you give Chicago Shares to someone on the street, the recipient can redeem the shares for food or personal items at partner stores or restaurants. Shares cannot be used for tobacco, liquor or cash, so you know you’re providing a meaningful gift that really will help the recipient. If you’re not comfortable giving on the street, Chicago Shares can still help feed people in need. Chicago Shares puts the money from unredeemed shares into a fund. This in turn is granted to agencies that provide social services. In 2016, Chicago Shares donated more than $15,000 to ten area “feed the hungry” organizations, such as Common Pantry, Catholic Charities and Franciscan Outreach. Chicago Shares is 100 percent volunteer run, so all of the money you spend goes directly to feeding people in need (and yes, your Shares purchase is tax-deductible). Whether you choose to give on the street or to purchase Shares to hold, Chicago Shares provides an efficient way to help feed people who are hungry in Chicago.